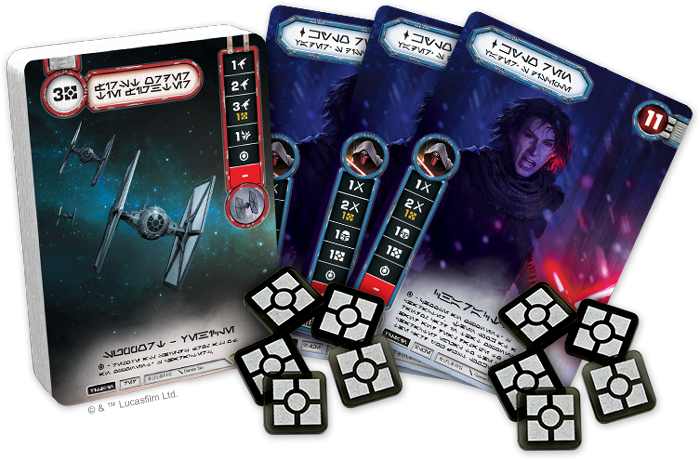 Preview the Star Wars™: Destiny Q1 Tournament Kit! Establish galactic control with prizes from the Quarter 1 Tournament Kit for Star Wars™: Destiny! Quarterly Tournament Kits provide prizes for a local game store to award to players for competing in their events and a new kit will be released each quarter with refreshed prizes to invigorate participation. Contact your local game store today to see if they are hosting any tournament kit events and join in on the fun! What Prizes are in the Star Wars: Destiny Q1 Tournament Kit? Core Prize Card - 16 copies of the alternate art card “First Order TIE Fighter”. If you’re looking to add powerful fire support to a Villain deck, call in one of these things. Just like the Rey card from the Launch Party, the text is written in Aurebesh™, the language of Star Wars. 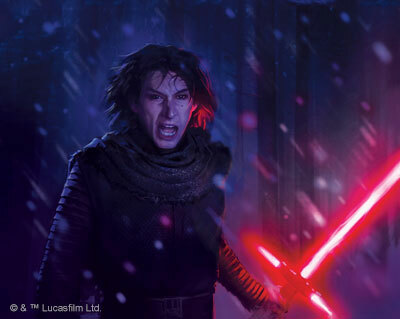 Elite Prize Card - 2 copies of the alternate art card “Kylo Ren”. Also in Aurebesh, you can show your opponents the Dark Side with this powerful character card! Elite Prize Item - 2 sets of 5 acrylic Resource Tokens. Resources are an incredibly important part of the game and you can show your success with these tokens! An additional copy of each prize card is included for the organizer to keep or award, at their discretion. What Can I Expect at a Tournament Kit Event? Every Star Wars: Destiny Tournament Kit comes with an optional outline for a tournament that your retailer can choose to follow. If your local retailer announces they are hosting a Fleet Patrol event, you can expect to play three matches of Star Wars: Destiny. If you do well in the competition, you will be eligible to earn some cool prizes, as detailed in the event outline below. Retailers can also choose to create their own tournaments and special events, such as demo days, charity events, or alternate play formats in order to support their gaming community. If this is the case, they may have different plans on how they would like to award these prizes. Make sure you contact your local game store to see what kind of event they are hosting! Each quarter, there will be a new set of tournament kits for our Organized Play supported games! Keep your eyes out for the contents of the next kit and make sure that your local game store has ordered theirs for the season! Note: The alternate art cards in this kit are produced via FFG's In-House Manufacturing and may appear slightly different in color and texture from the game's other cards. To be tournament legal, these cards must be sleeved with opaque or art sleeves.